Brief Description of Subject: During a storm on the Sea of Galilee, Jesus stands in a sailboat with his right hand lifted to heaven while 4 disciples huddle in the bottom of the boat. 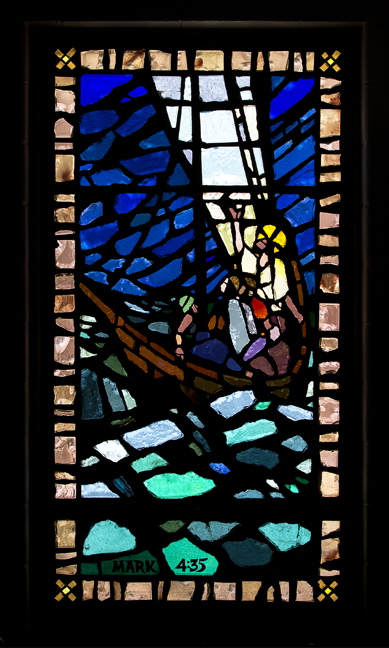 This window depicts the familiar story of Jesus and the disciples crossing the sea (or lake). Suddenly, they were engulfed in a powerful storm which would have swamped the boat. Jesus spoke to the wind and waters and they became still. This story is in all three of the synoptic Gospels: Matthew, Mark, and Luke. (Synoptic means “from the same viewpoint,” and we describe the first three Gospels as synoptic because they all present a view of Jesus that is essentially historical. The Gospel according to John is primarily theological.) Matthew tells us that they had been in and near Capernaum, which is located on the shore of the Sea of Galilee. Mark says they were beside. Mark and Luke both say that they arrived in the land of the Gerasenes opposite Galilee. So, probably, this story took place on the Sea of Galilee (which is also called Lake Gennesaret). This window also used shadings of color to advantage - especially in the water and the sky. Shades of blue-green represent the water. Darker shades indicated the waves of the storm. In the blue of the sky, darker shades are also used to indicated the storm clouds and winds. The angle of the boat indicates rough water. The sail of the little ship projects out of the top of the window. In the boat Jesus stands with his right hand lifted to Heaven as he commands the storm to be still. At his feet are four disciples huddled in the bottom of the boat, seeking safety This window is one of the most nearly monochromatic of the window series. Most of the colors are very closely related. It depends upon shading for the impact of the story portrayed. On November 6, 1975, while installing one section of the window, a workman fell and the section was broken. The workman was not injured seriously. The section was redone, and the window was installed Feb. 27, 1976, and dedicated Mar. 7, 1976. The window was donated by the Women’s Fellowship in memory of all who served the church and especially in memory of those members who have done so much for the benefit of the church. Artists Richard Hanley and Mark Taleba. Installation by Omnibus Studios, Okemos, MI.